This week we read the traditional haftarah for Vayyikra, where the prophet speaks first of Israel’s transgressions, then prophesies against idolatry and finally speaks of Israel’s redemption. Leviticus 1 speaks of five types of sacrifice: the burnt offering (עֹלָה), the meal offering (מִנְחָה), the peace offering (שְׁלָמִים), the sin offering (חַטָּאת) and the guilt offering (אֲשָׁם). In the Haftarah, God addresses Israel through the prophet – Isaiah or Deutero Isaiah -, berating the Israelites for turning away from Him and for failing to worship him with sacrifices as prescribed in Leviticus. This is followed by a reminder that God forgives and blesses Israel, who is called God’s servant and chosen one. There is a satirical description of idol worship practised, one might suppose, by the Babylonians, followed by a triumphal song of Israel’s redemption. The people that I formed The word ‘chosen’ is not used, but the word לִי, for myself, indicates that Israel belongs in some way to God, that, as we shall read, Israel is God’s servant. Because they were mysteriously chosen for divine service, they have a duty to separate themselves from the idolatry that surrounds them. Israel has neglected God, failing to call on him and becoming weary of Him. We should note that the name of the sidra and the Hebrew name of the book of Leviticus is Vayikra, which means ‘And he called…’. The name of the book comes from the first word: וַיִּקְרָא , ‘And God called to Moses and spoke to him from the Tent of Meeting. Then you will call upon me (וּקְרָאתֶם אֹתִי) and come and pray to me, and I will listen to you. You will seek me and find me when you seek me with all your heart. which has been absorbed into the havdalah prayer. For Jeremiah, the calling makes possible the interactive relationship with God and for Isaiah in this verse, it is Israel’s obligation, in which they have defaulted. The word יָגַעְתָּ means ‘you wearied’. The verse means either ‘you were weary of me’ or ‘you did not weary yourself.’ The KJV has Thou hast been weary of me but the Douay-Rheims Catholic bible has Neither hast thou laboured about me. The two translations have different emphases and the second one makes לֹא, not, refer to the verb ‘you wearied’ as well as you called [not]. Isaiah speaks of the sacrifices which the Israelites have neglected: lambs for burnt offering (olah), meal offerings (minchah), levonahand cane. Ibn Ezra pointed out that the Israelites were unable to offer sacrifices during their exile in Babylon. The Greek word for frankincense is λιβανως, obviously the same word as in Hebrew. Our word frankincense comes from old French franc, pure, and Latin incendere, to burn. The purity of the incense adds to the value. Take the following fine spices: 500 shekels of liquid myrrh, half as much (that is, 250 shekels) of fragrant cinnamon, 250 shekels of fragrant cane. There is a play on words in the Hebrew: לֹא קָנִיתָ לִּי בַכֶּסֶף קָנֶה. For the third time we find the verb י ג ע in the phrase you have wearied Me with your iniquities. Again it takes the hiphil causative form: הוגַעְתַּנִי. In this verse and the next, we find the three terms for sin which are mentioned together in the Yom Kippur liturgy: חָטָאות, עוֹנות and פְֹּשָעות. You may recognise this verse from Yom Kippur. Note the emphatic use of the first person pronoun, not only in the repetition but in the form אָנֹכִי, always stronger than אֲנִי. The Brown, Driver and Briggs suggest that the third syllable of anochi has a demonstrative function, perhaps related to כֹּה – thus. They find that אֲנִי is predominant in later books of the bible. ‘Remind me’ comes directly after ‘I will not remember,’ anthropomorphically attributing to God remembering and not remembering, neither of which – if taken literally – is compatible with omniscience. This is not the only instance in Isaiah where God invites the children of Israel to a dialogue. Undoubtedly Jacob , the eponymous hero of the nation is meant (cf Hosea 12:3ff), not Abraham (who is never spoken of in the later literature as sinful), nor the earliest ancestors collectively; still less Abraham. This was Jeroboam, whom Israel chose as king, not according to word of God. There is no way to tell whom Isaiah had in mind. Some believe he had Adam in mind, but since Adam is never referred to as Israel’s forbear, that is improbable. Most likely Abraham is meant, and the sin he committed was to have doubted God’s promise, when he fled Canaan and went to Egypt. Who are the holy princes? Ibn Ezra says the priests and Redak says the Levites. The phrase ‘holy princes’ refers to the priests in 1 Chronicles, where the subject of the text is the priestly descendants of Aaron and the allocation of their duties in the Temple. …There were officials of the sanctuary and officials of God among the descendants of both Eleazar and Ithamar. [Hashem] has brought her kingdom and its princes down to the ground in dishonour. Jacob, also called Israel here, is mentioned in an altogether different light. 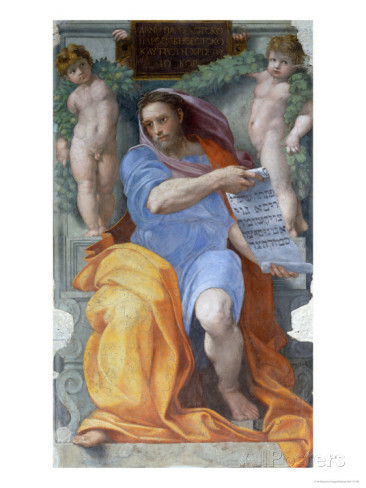 Jacob and Israel are named in apposition, referring to the people Israel. Being chosen is linked with being God’s servant. Ibn Ezra says that this could refer to Jacob the patriarch or to the inception of the nation Israel. There are fifteen biblical instances of the term ‘Jacob my servant’ but Jacob is not the only name privileged to be called servant; the instances of David being called God’s servant are even more numerous. Jacob however is synonymous with the people Israel, not the case with David. Servant is a recurring theme of Deutero Isaiah and this passage is among the ‘Servant Songs’ which include the Suffering Servant of Isaiah 53. The Servant Songs raise God’s servant to an elevated position. Isaiah uses the phrase ‘my servant Jacob’ six times; Jeremiah three times and Ezekiel twice. David is called God’s servant at least twenty-eight times in Samuel, Kings, Psalms and Chronicles. It is interesting that two men with notably self-serving characteristics are designated more than any others as God’s servants. Moses is called God’s servant just seven times. Yeshurun, believed to be from יָֹשָר, ‘upright’, is always a name of the people of Israel. BDB calls it a ‘poetic name of Israel’. There are only four biblical occurrences of Yeshurun.The LXX translated Yeshurun as ηγαπημενος which means ‘beloved’. The vulgate has rectissimus, most righteous, and the Greek translations of Aquilaand Theodotion have ευθυς which, meaning ‘straight’ is the closest approximation to יָֹשָר. If the shinin Yeshurun is identified with the letter sin in Israel, the names share three consonants. It should be noted that Targum Jonathan substitutes the name Israel for the name Yeshurun. The Isaiah Scroll from Qumran has Yeshurun. It would be interesting to know the contents of the lost Book of Yashar, referenced in Joshua 10:13 and 2 Samuel 1:18, to know if the name Yashar appears in it as cognate with ‘Israel’. This is a promise that the land will be fertile and the people will be blessed and flourish. Targum Jonathan has: This one will say ‘I fear God’. With this name they will boast to the gentiles that they are of the holy seed. Ibn Ezra interprets the phraseוּבְשֵם יִשְרָאֵל יְכַנֶּה – ‘adopt the name of Israel’ – as referring to proselytes. εγω πρωτος και εγω μετα ταυτα. Who will call [that he is] is like Me and will tell it and arrange it for Me, since my placing the ancient people, and the signs and those that will come, let them tell for themselves. Most translators seem to pick up the theme that no one can be compared to God, who alone determines the future. ‘Ancient people’ could be Israel, but Rashi says ‘all creatures’: כל בריות. העם הראשון וטעם עולם בזמן שעבר The first people, and the meaning of olam is ‘in past times’. For אֹתִיּות, he explains: ‘the work of peace’. “You are my witnesses,” declares the Lord, “and my servant whom I have chosen, so that you may know and believe me and understand that I am he. Before me no god was formed, nor will there be one after me. I, even I, am the Lord, and apart from me there is no savior. I have revealed and saved and proclaimed– I, and not some foreign god among you. You are my witnesses,” declares the Lord, “that I am God. The idea that Israel is to be a witness to God’s reality and goodness is closely related to the task of being a light to the nations. For how was this noble goal to be achieved? Not by missionary effort, but only by Israel being true to the Covenant and becoming an example to the gentiles. This is a long, satirical diatribe against the making and worship of idols. ‘Idol makers’ is a literal translation of יֹצְרֵי־פֶסֶל . The idol worshippers are not identified as Babylonians, although the passage may allude to them. To whom, then, will you compare God? What image will you compare him to? As for an idol, a craftsman casts it, and a goldsmith overlays it with gold and fashions silver chains for it. A man too poor to present such an offering selects wood that will not rot. He looks for a skilled craftsman to set up an idol that will not topple. The craftsman encourages the goldsmith, and he who smooths with the hammer spurs on him who strikes the anvil. He says of the welding, “It is good.” He nails down the idol so it will not topple. “But you, O Israel, my servant, Jacob, whom I have chosen, you descendants of Abraham my friend, I took you from the ends of the earth, from its farthest corners I called you. I said, ‘You are my servant’; I have chosen you and have not rejected you. Claus Westermann pointed out that Isaiah’s account of pagan artisanship fits Babylonian records about idol-making. Deutero-Isaiah was acquainted with Babylonian customs, and satirizes them here and elsewhere. Perhaps the three passages in Isaih 40, 41 and 44 are variations of one original text. שעשיתי בהיותך בארצי Remember these things that I did when you were in my land. This has ‘Remember these’ refer to the verses before the description of idolatry in verses 9-20. Jacob and Israel are mentioned together as in 43:22, 43:28, 44:1, 44:5; 44:22. The use of Jacob and Israel in apposition is especially prominent in Isaiah and in the Psalms, attested notably also in Jeremiah and Micah. This, like 43:25, is repeated in the Yom Kippur service. Note the second person singular: thy transgressions, thy sins. העוברת בצאת השמש איננה It passes – when the sun comes out, it is no longer there. This verse has two words for a cloud: עב, a thick rain cloud and ענן, a white cloud that lets it through. Transgressions are likened to an av, and sins to an anan. עב is, according to BDB, from a verb ע ו ב to hide or cover with cloud. It occurs as a verb in Lamentations 2:1. The rainbow of Genesis 9:13 appears in an anan, and the pillar of cloud which the Israelites follow in the wilderness is an anan. When God appears in a cloud in the Tabernacle  and in the Temple, the word anan is used. עב conveys cloud in the sense of severe weather, darkening the sky or hiding the sun. This is a poetic verse in the category of joyful song, praising God for the erasing of sins and the redemption of Israel. The personification of nature is reminiscent of Psalms 29 and 114. The lowest extremities of the earth and the mountains. the forest and the trees are drawn into this metaphor of singing a rina, and the reason for joy is the redemption of Jacob, the glorification of Israel. This is a parable that there will be great happiness in Israel, for when Israel is redeemed God’s glory will be revealed to the whole world. Hellenistic Jewish translator of the bible into Greek, c 200CE.